Jatsön Nyingpo (Tib. འཇའ་ཚོན་སྙིང་པོ་, Wyl. 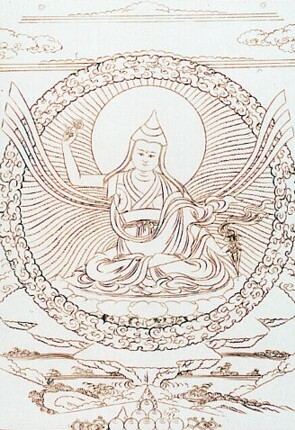 'ja' tshon snying po) (1585–1656) was a Nyingma master and a tertön. His main terma cycle is the Könchok Chidü. Jatsön Nyingpo was born in Kongpo. His root incarnation was Nyang Tingdzin Zangpo. Jatsön Nyingpo's termas are collected in six volumes—the Jatsön Pö Druk. The Könchok Chidü constitutes the first of those volumes. In the Kongpo Puchu Tadul Sergyi Lhakhang, he brought to light texts associated with the hidden-land of Pemakö. In the Drubpuk Cave (Wyl. sgrub-phug), the 'Realization Cave', in Kongtrang (Wyl. Kong-'phrang), Jatsön Nyingpo uncovered the cycle Dorjé Trolö Tsalgyi Drubkor (Wy.. rdo rje gro lod rtsal gyi sgrub 'khor), together with a route description and prophecies for Pemakö. Those who enter this realm obtain the Vajra body and dissolve into rainbow light upon death. Merely taking seven steps toward Pemakö guarantees rebirth in this pure realm after death. (Lam yig: 13; 4-6). When the Qosot Mongols overran Central Tibet in the middle of the 17th century, Jatsön Nyingpo appointed his disciple Rigdzin Düddul Dorje to go to Pemakö and to convert the aboriginal tribes of the Yarlung Tsangpo (aka Brahmaputra) gorges to the Buddha’s teachings and open the way to the hidden land. ↑ Kongpo Puchu Tadul Sergyi Lhakhang is one of the Yangdul Lhakhang Shyi, the ‘Four Temples for Further Taming’ established by King Songtsen Gampo. The list of these temples includes Kongpo Puchu, Lhodrak Khoting, Chamtrin Degye, and Changdra Dumtso. ↑ Franz-Karl EHRHARD, ‘The Role of “Treasure Discoverers” and Their Writings in the Search of Himalayan Sacred Lands”, in T. Huber (ed.) Sacred Spaces and Powerful Places in Tibetan Culture. Dharamsala: Library of Tibetan Works and Archives, 227-39, The Tibet Journal 19,3 (1994). ↑ Hamid Sardar-Afkhami, ‘An Account of Padma-Khod: a Hidden Land in Southeastern Tibet’, Kalaish. This page was last edited on 10 November 2018, at 11:40.